It is most common for the scorpions that live in our San Tan Valley, Arizona deserts to lay dormant until late in March, but with such soaring temperatures early this year, they are out and searching for their new nesting spot early. San Tan Valley has experienced this annual dread almost three months earlier than expected and to homeowners across the Valley there is an increased fear and wonder what is happening in the grass when the lights go out. Not only do all of us living in San Tan Valley have to deal with triple digits making our car seats unbearable to sit on or plants impossible to keep alive – we have to deal with venomous pests as well. *Insert the not-stoked-about-it emoji here*. This is not the greatest news for homeowners, but thankfully we’re friends and Varsity Termite and Pest Control can handle this stinging little problem with experienced scorpion control and scorpion home sealing. Found outside, in fences, under pots and, more scarily, inside in showers, in bed sheets and behind picture frames, scorpions are dangerous and downright creepy. Stucco walls, commonly known as “scorpion hotels”, are a fundamental piece of the San Tan Valley construction world and among the top places that these unwanted pests hide out. We understand how truly unfortunate (for lack of all other colorful wording) it would be to find a scorpion while putting on your favorite shoes, so please let us handle it before it get’s out of hand. There are almost 2,000 types of scorpions in the world, and just about 50 different kinds in the Sonoran Desert alone, that live in all parts of this earth with the exception of the arctic. Those of you with arachnophobia, we suggest down for your arctic jacket. Most commonly San Tan Valley encounters the bark scorpion. These small brown scorpions are hard to see, sneaky and are of the type that can climb walls and trees, making home access more readily available – and need we say it again? Awful. At a small three inches long at their biggest, these tiny terrifying creatures can inhabit places small and large and make those dreadful nightmares come true. Unfortunately the scorpions that we have to deal with in San Tan Valley are the most dangerous. As if the fact they exist wasn’t enough to make your skin crawl – they can be deadly. Fantastic. Our San Tan Valley bark scorpions may be hard to spot, but wait until about 8 in the evening with a black light and you can spot them glowing bright green. A glowing exoskeleton make their bodies glow under the light and can be found in the evening hunting insects that generally seek refuge on homes such as spiders and smaller bugs. Some scorpion stings can be treated at home, as many people do not even suffer side affects – at least those with good immune systems. Children and older adults seek medical treatment, making up for the 12,000 reports per year of these super stingers. Death from a scorpion sting is rare, although we suggest it doesn’t hurt to seek medical attention if you’re at all worried. Common symptoms are pain and swelling of the site, and people report reactions that range from feeling faint to incredible bizarre “high” feelings. Honestly unless you are willing to learn scorpion control via Youtube (which we are sure there is a channel dedicated to this) and feel confident in its ability to teach you how to rid your home of them (which we think highly unlikely), we would leave it to the pros at Varsity Termite and Pest Control. Many San Tan Valley scorpion control exterminators will try to rid you of the problem through population control. It’s easy for us to get rid of them but making sure they do not come back is our major concern. 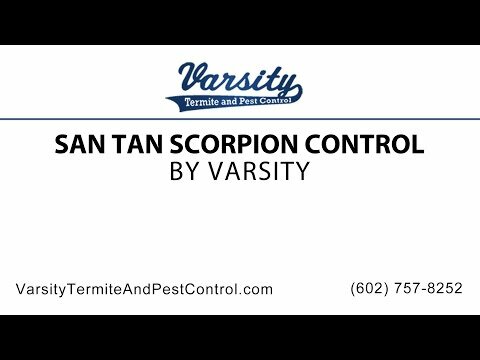 There are many exterminators that specialize in San Tan Valley scorpion control, including Varsity Termite and Pest. It is worth it to read reviews and ensure the training and expertise of the exterminator of your choice, as scorpions can be dangerous and daunting to control. Be aware of areas that are more prone to scorpions such as garbage cans, lumber piles, bricks (especially those with deteriorations), old cardboard boxes, soil in potted plants and in the garden beds, and leaf or other debris piles. They are always looking for their next meal so be aware of where insects such as spiders that they hunt for would be prone to nest. Our advice would also include checking your shoes before you slip in to them…not to freak you out or anything. Varsity Termite and Pest Control leads the Valley in scorpion home sealing and scorpion control through using a scorpion barrier. To protect you and your home from these insects we dust areas such as the foundation, electrical outlets, block fences, cracks in stucco, attics, door frames, screening to vents and electrical outlets to prevent any of this arachnids from entering your home. Give our San Tan Pest Control Experts a call today!